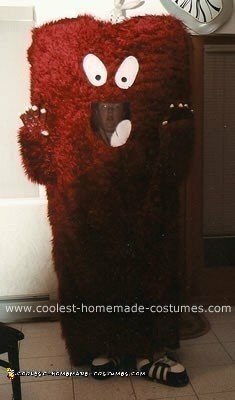 I really wanted to do this Homemade Gossamer Costume for years so I decided how. I got foam and cut it to sit on my head and be tall. Then I laid the fur over the top and glued it on top of the foam. I put suspenders through the foam at the shoulders to keep it attached to me and so I could dance in it, which I did. I put see through black in the mouth so I could see and used felt to make the tongue and eyes. I bought devil hands from the store and giant sneaker slippers to finish it off. I put Bugs Bunny on my head to finish it off.